We buy gold for many reasons—as monetary insurance, a crisis hedge, and even for simple diversification. And another one of those reasons is coming to the fore right now: as a hedge against overvalued stock and crypto markets. 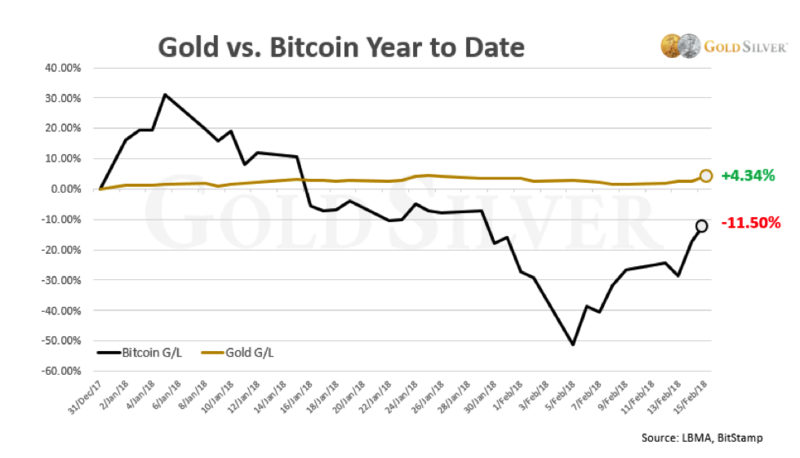 We’ve been saying for some time that sooner or later these two markets had to correct—and that gold would serve as a buffer against those inevitabilities. It’s a short and simple message, but one that is crucial for investors to address: Are you sufficiently hedged against overvalued equity and cryptocurrency markets? Through the end of last year, the S&P had nearly quadrupled from its 2009 low. This run currently ranks as the second-longest bull market in the last 140 years. It was clearly getting frothy; the only questions were when it would reverse and how big that reversal would be. As you know, 2018 has seen an abrupt increase in volatility in the stock market. While the stock market has experienced some sudden and scary drops so far this year, gold has risen. The flight to gold as a safe haven has pushed the price higher. This is a small taste of what gold can do as a hedge against stock market volatility. The question you as an investor have to ask is this: is the market weakness and high volatility over? At what point do stocks—the largest asset allocation of most North American retirement plans—enter a bear market? And how bad does it get? The sober reality is that the risk of the market continuing these scary nosedives is high. And we’ve shown that gold can hedge a stock market crash. We’re not the only ones saying this. 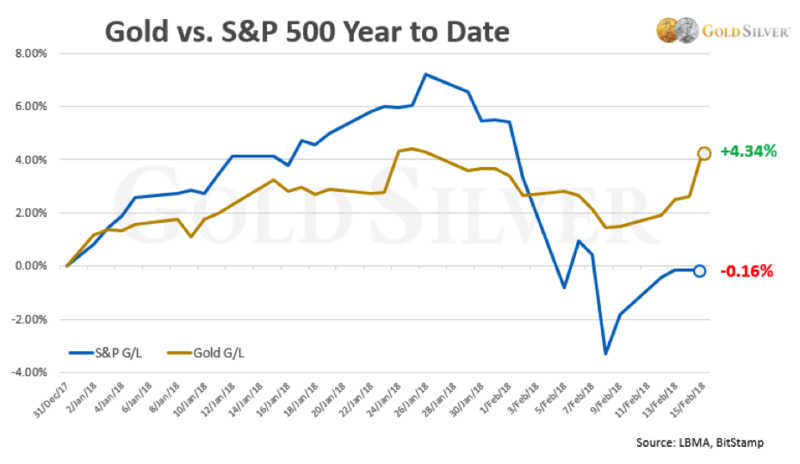 A new report from Bank Credit Analyst said that during periods of negative equity returns, gold has historically outperformed stocks 79% of the time. And in periods of rising volatility gold outperformed equities 64% of the time. Both of those risks are on the increase right now. What is more likely going forward is a falling stock market and higher volatility. One reason to own gold is to insure against those events. Will cryptos serve as a hedge against a falling stock market? The honest response is that it’s not possible to answer that question yet. Cryptos have far too short of a history, and are far too volatile. On top of that, they were overdue for a correction as well. That correction came, and here’s how gold has performed against it. The price of Bitcoin peaked on December 17 at $19,908.10, and had risen a total of 1,226% in 2017. The price has since fallen by half, and you can see that gold hedged against that downdraft. This is exactly what gold can do for a portfolio. These mini-crashes are but small examples of how gold can hedge other investments, and even profit when they decline. It is a core reason to own gold right now. Gold is one of the very few investments that can hedge the kind of market weakness and increased volatility we’ve seen this year. Without it, any other investment you own is almost guaranteed to suffer when the next scare inevitably hits the markets. As you know, Mike Maloney believes there is much more of this to come: He has predicted not just a stock market crash, but a collapse of the US dollar and global economy. It is critical that you have a full position of physical gold and silver before those events take place. Mike and I and everyone else at GoldSilver are in metals now—we’re not waiting. We hope you’re with us. Here’s what I’m buying.